Monastery of Mount Athos, Greece. On Good Friday, Christ died to redeem the sins of mankind on the Cross at Golgotha outside Jerusalem (Matt.27,33-56; Mark 15, 22-41; Luke 23, 33-49; John 19, 17-30). This composition shows Christ on the cross on top of a hill with the Virgen Mary and St. John the Divine at the sides facing Christ. 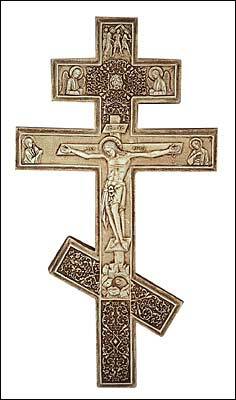 At the top of the cross there is an scene of the procession showing Christ carrying the cross on his shoulders. Below this are images of Archangels Michael and Gabriel facing each other. The crucified Christ is shown dressed in a loincloth, with head sunk down and blood flowing from his wounds. The skull inside the hill is that of Adam.